Assembla.com is a combination of programs designed to improve intra-unit cooperation and task assignment for programmer projects. This includes Assembla Workspaces, which is a code repository and management tool to increase productivity, and Assembla Portfolio, which enables management of multiple projects and management reporting. They can service private as well as public projects by creating workspaces. Repositories: Offering Subversion, Git and Mercurial repositories, Assembla promotes an easy-to-alter working environment with great visibility and effortless integration. Boasting almost 100% uptime, Assembla’s hosted Git solution is flexible on demand, highlights the latest code changes, accepts branch or fork code changes, can automate manual tasks and easily creates public websites. Ticketing: Assembla offers a thorough and reliable ticketing service with sophisticated issue, bug and task management tools. The smooth Web 2.0-style UI helps visualize the workflow through List, Agile and Cardwall views, customize the ticketing system as the project progresses, add comments, estimate reliably, link codes with requirements, and submit support and feature requests. Collaboration: The software can improve teamwork by streamlining cooperation through wikis, message boards, file sharing and StandUp reports. 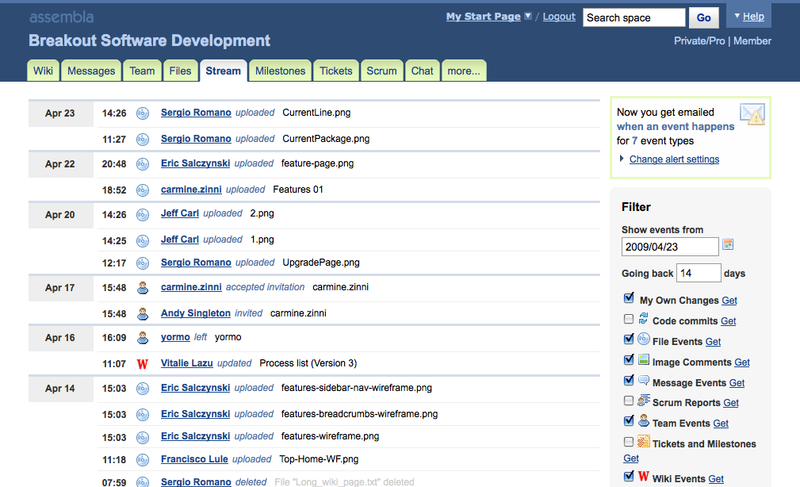 Assembla lets developers create informative pages, communicate efficiently, and monitor the team’s progress as a whole. The group chat feature with its video option lets team members communicate quickly and receive quick clarification. : Focused on project-oriented businesses, Assembla enables easy supervision and progress tracking to meet deadlines within budget. Management can access real-time project tracking as well as task reports and metrics to analyze performance. The simplified accounting and billing system and the personalized reports promote better task assignment and improved performance. Assembla offers its Subversion/Git hosting and open source workspaces for free. Group projects can take advantage of its 15-day free trial. Four plans are available for group projects. Assembla is designed for project-oriented businesses such as software development, online consulting firms and firms that outsource to freelancers. More specifically, it is useful to project managers who need to coordinate multiple teams and developers, and to the programmers themselves to coordinate their efforts as efficiently and productively as possible. The software is currently translated into Spanish, Russian and Vietnamese as well as English, although additional languages will be made available soon. Some of Assembla’s more notable clients include HTC, ScalaIDE, Nooku, SHARP, Lift, Quicksilver, Apprenda, sproutlet.io, Dolce and Gabbana, Puma, and Gravity Jack. These are companies striving to develop new products quickly and inexpensively. Assembla offers open source projects a free workspace where developers from around the world can cooperate on their software. Furthermore, it is a low cost administrative solution available for small and medium enterprises to effectively outsource some part of their code development. Finally, it allows for code voting and commentary. A global technology enterprise, Assembla is used by more than 500,000 users in 100 countries. Its cloud-based interface specializes in hosted subversion solutions to tackle planning and tracking problems and enable its users to efficiently manage projects at a low cost. Based in the U.S., the company also offers wide language support.